Cinema history is full of unique movements and styles that have popped up from time to time. From French Impressionism to the Nouvelle Vague, from Surrealism to Dogme 95. But my favorite of all the cinema movements is perhaps one of the shortest lived - German Expressionism. Born out of Robert Weine's The Cabinet of Dr. Caligari (more on that one later in the month), German Expressionism was characterized by its bizarre, dreamlike set design and stark black and white contrasts that often evoked madness or evil, and continued to be influential even after the movement ended. Films such as Carl Dreyer's The Passion of Joan of Arc and Fritz Lang's M contain subtle elements of Expressionism in their designs, leaving the almost subconscious impression on the audience that something is a little off. After the success of Caligari, along came Paul Wegener's The Golem. Based on an old Jewish legend, The Golem tells the story of a rabbi who turns to sorcery to conjure a creature out of clay to protect the Jews of Prague from persecution. A clear precursor to Frankenstein (the old myth actually served as an inspiration for Mary Shelley's original story), The Golem features impressive special effects for its time, but its most impressive aspect is its stunning design. 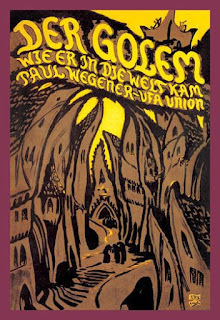 While lesser known, The Golem is up there with Caligari and Metropolis in terms of its set design. And even though the Golem itself looks a bit goofy by modern standards, it actually manages to conjure up a pretty palpable feeling of unease. It's one of the very best examples of early horror.